A well-equipped Anesthesia Department with a team of qualified and dedicated anesthetists assure you the best surgical services. Highly experienced team to handle critical surgeries like Cardiac surgery, Neuro-surgery, Uro-surgery, Plastic surgery, Thoracic-surgery, Joint Replacement-surgery, Micro Vascular-surgery, Onco-surgery, Obst.Gynaec- surgery etc. Renal transplants & Pain management are the other feathers in its cap. Regular CME programmes are conducted to update and keep the staff informed about the latest advancements. As a result, the patients get the best services. Our Anaestheists are looking after OTs, ICU, Emergency services etc. 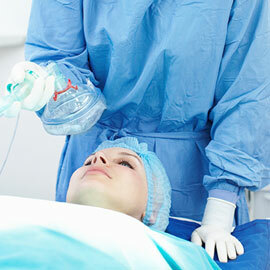 Being a tertiary care centre, all high-risk cases, terminal cases are taken care over here. Our team members have given many presentation at state & national level conferences.